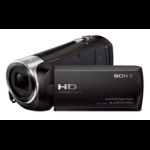 Hand-held camcorders allow you to record your own video and make photo shots. You can always have such cameras with you to record the important moments of your life and share them with friends or family. You can even make your own movie!